The primary addition in the update, 4.1.0, is support for Moments. These allow users to track an ongoing trend or event through curated tweets, including photos, GIFs, and videos. 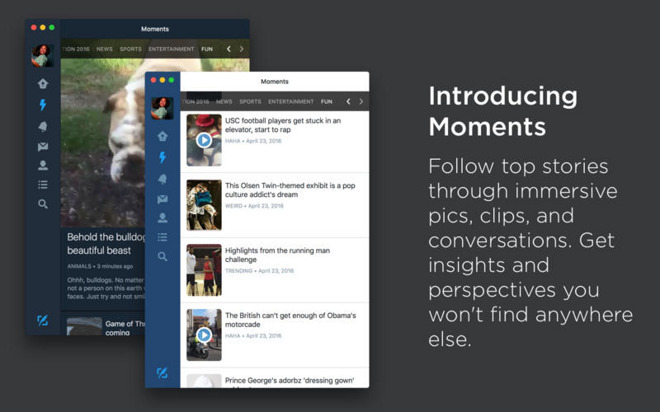 Moments originally launched for mobile last October, and it's not clear what might have caused a delay on Mac other than Twitter's mobile-heavy focus. The Mac client now also supports another feature introduced last October, custom polls. New ones can be created for virtually any topic, and posted in just a few clicks. Each lasts 24 hours. A new GIF search function, lastly, should make it easier to post looping animations in public tweets and in direct messages. The Twitter Mac client is a free download from the Mac App Store. The latest version requires OS X 10.10 or later.